Ever hear of beach cruisers? Ever heard of cyclocross racing? Ever heard of a beach cruiser cyclocross race? Well that is exactly what the Fun Fun Underground Forest Race has been all summer long (see our post on it here). 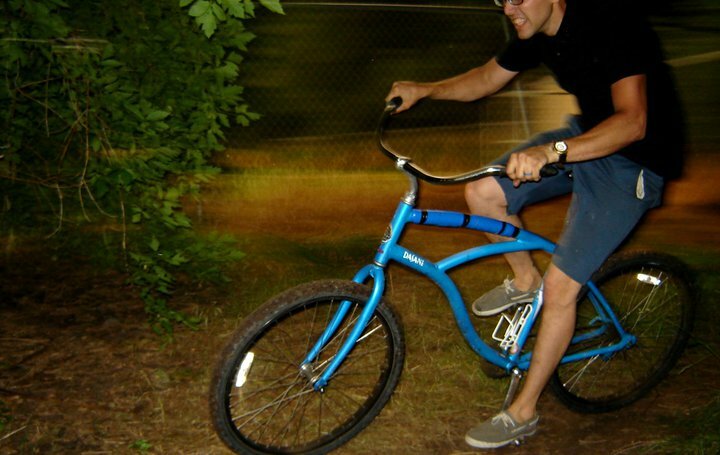 The idea of the race is that you get a beach cruiser or beater bicycle (think full suspension walmart bike), a helmet, and you race it against other people riding the same thing. Over the summer there has been over 8 different variations of the course that they race and each one has been as epic as the last, on the really good races they have a river crossing where you have to either get off your bike and carrier it across the river, or for the really brave you can just ride right through like the photo below illustrates. The race is open to everyone, and the more who race the more fun everyone has. If your not the racing type there is always the very important role of spectator to cheer racers on. The spectators usually line up along the course and cheer and shout for the riders and then, on the last lap, they run over to the finish line to cheer everyone on. You may be asking what is the point of this race? The point is to have fun, plain and simple. There are no sponsors, no teams, just a bunch of awesome people getting together for an awesome ride. There’s that, and the awesome trophies for the top three finishers, first place trophy is about 5ft tall! Simply put, grab your bike, get ready to get muddy, and come out to get a taste of the glory. If you do not have a bike that is suitable there is always at least two bikes for people to use so do not let that stop you. Again, if you are not going to race the role of spectator is just as important and just as fun. Check out the Facebook event for all the information and to ask any questions you may have. BikeProvo will be there to get pics and report on all the awesomeness so, if you are there your picture will make it on the blog! Here is all the important info. Why: For fun, for bikes, for glory.